Justin Donawa was crowned the triple jump champion at the 2018 Ivy League Heptagonal Championship, marking his second Ivy League title of the year as he is also a member of the championship soccer team; making the Bermudian athlete the first to accomplish this ‘double feat’ since the 1990s. Donawa attends Dartmouth College and school’s report said, ”The Dartmouth men’s track & field team finished fourth at the 2018 Ivy League Heptagonal Championship inside Leverone Field House on Sunday. 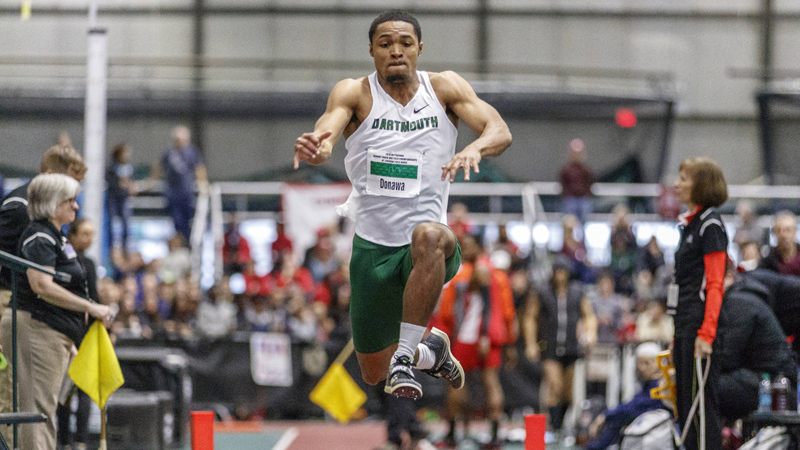 “In an impressive performance that stunned many in Ivy League circles, but few at Dartmouth, junior Justin Donawa was crowned as the conference champion in the triple jump. “Donawa’s 15.57m/51-1.0 came on his first attempt of the day and was good enough to secure him the title and the 10 points. After finishing fourth in last year’s meet, Donawa took the crown at home and snapped Harvard  and Princeton’s  seven-year stranglehold on the triple jump title. “It was his second Ivy League title of the year as Donawa is also a member of the Big Green men’s soccer team that captured the Ancient Eight crown. Justin Donawa — who has represented Bermuda internationally in both football and track & field sporting events — is following in his family’s footsteps with his outstanding sports showings, with the Donawa family having a long history of athletic excellence.